The ‘Timer with Sections’ supports you during your performance (e.g., a talk or keynote speech, a seminar or lecture, a workout) by providing intuitively visualized timing information. It allows you to structure time into ‘sections’. During your performance, you can easily adjust the the schedule by moving time across sections, with a swipe gesture (e.g., when feedback from the audience requires you to skip or intensify a section of your performance) or by pressing the pause button (e.g., when a answering a question from the audience requires some extra time). Structuring a Performance: Available time can be divided into sections. Visualization of Time: The performance assistant view intuitively visualizes the remaining and elapsed time, both for the current section and the whole performance. Elapsed time is depicted in red, remaining time in green. An inner disc represents the used and remaining time for the current section. The section title is displayed in the center. An outer ring represents the used and remaining time for the whole performance. The segments of the ring represent the individual sections. 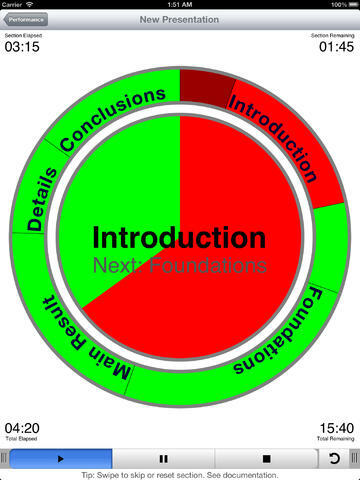 Paused time (see below on the concept of pause) will is depicted in dark red. Extra time obtained by skipping parts of a section (see below on the concept of skipping) will be depicted in dark green. Alarm Option: Optionally you can set an alarm at the end of each section. If set a short tick sound will signal the end of a section. Note: The iPhone will vibrate if you have configured "vibrate" in its sound setup. Managing Time during a Performance: Except for the stop button you cannot interrupt, pause, extend or shorten a running performance. However, there are advanced possibilities to flexibly adjust the length of a section during a running performance, by moving time among sections. For example, your performance could have a section containing additional results which you might want to shorten or skip in favor of extending another section. * Pausing: Holding time for the current section, by shortening a later one. * Skipping: Skipping remaining time of the current section, by extending a later section. * Resetting: Setting elapsed time to zero for the current section, by shortening a later section. Leaving the Application: If you leave the performance assistant view or even the application then the timer continues to count down. If you return to the performance assistant view it will recover its previous state, including the elapsed time. If the performance assistant view is interrupted by pressing the home button or an incoming call, then a running performance is automaticall switched to ‘pause’. Logging a Finished Performance: Upon finishing a performance you are ask if you like to log that performance. If you log the performance, then data as the actual time run or skipped is stored for each section. This is allows you to analyse your performance and hence adjust and improve your schedule. A log of a performance can be viewed at any later time. It can be exported via email. Rehearsal: If you are creating a new performance you should use Performance Assistant in a rehearsal. Then analysing your time requirements by checking the log file. Buffer Time: Consider adding a shinkable section with optional topics or just a general discussion sections towards the end of your performance such that it can serve as a buffer. Note that you can pause a section only if such a buffer exits. – Added an option to the properties of a Performance. You may choose if the timer start immediately when show or it it will be in stopped state when shown. – Improved interface compatibility with iOS 5 and iOS 6. – Four build in alarm sounds (which also work in background notification). – Minor improvement to the UI (added a restart button, the annoying restart dialog is gone). – In the visualization view, control elements (run, pause, stop) can be moved away by sliding them to the edge of the screen. This reduces the risk of unintentionally activating a button on these controls. – Custom alarm sounds: Sound files added to timer can be selected as an alarm sound. This can be done for each section individually. 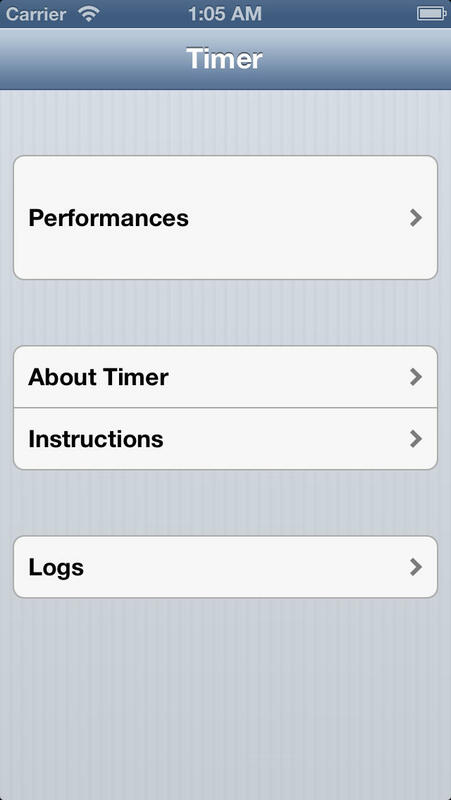 You add sound files to Timer via iTunes file sharing or by sending sound files to Timer via Open in "Timer". Note: Sounds will be played only if their length is shorter than 30 seconds. – Duplication of section definitions. – Local Notifications: If the app is suspended to background (pressing the home button) during a running presentation, you will receive a notification at the end of each section for which the alarm option is set. Note that notifications only appear if the alarm option is set and you only receive notifications for a running performance. – TV Out improvements: The timer visualizations will continue on the external screen even if you switch to another view in the timer app. This feature can be useful if you want to prepare the next performance. Note: The visualization on the external screen cannot be updated while the app is suspended to background. – Landscape mode: On the iPad the app rotates to landscape (may be disabled via the corresponding iOS switch). – Duplicate the definition of a performance by tapping "Options" in the performance list view. – TV Out: Timer will render its visualization on an external screen, if attached (e.g. to a beamer). – iPad compatibility: this is a universal app. Current users get the iPad compatibility for free. – iOS 4.2 compatibility: the app now uses some features of iOS 4.2. – Exports your data (section definitions) via mail using the button in the "About Timer" view. – Imports definition from a mail, e.g. to Timer on another iOS device.